The journey of Tango Card began when Leeds left his previous firm to start a new endeavor. While clearing his office, he came across ten gift cards worth $450, scattered beneath the files. In the quest to find a digitized solution, Leeds rolled out a significant monetary investment on gift-card focus groups and after interviewing around 300 consumers holding an average of five cards, he came to a unilateral realization: the requirement for modernization in the industry. 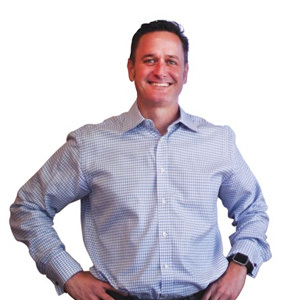 "Three fundamental beliefs drove the vision that I had for the company at the time: the industry needed to embrace digital delivery, API-driven products, and a new business model,” explains Leeds. But it was an uphill task ahead for Leeds as the gift card market that Tango Card was trying to crack was controlled by heavy industry behemoths. It was a time when startups that were not in the “$100 million” club, rarely gripped the attention of the big players in the industry. However, one thing that Leeds believes he had, which established brands didn’t have was hard research on gift card buyers. Once he had their attention, Leeds put together the plan to offer digital gift cards seamlessly integrated into modern software platforms. And the rest is history. Today, Tango Card brings rewards, recognition, and loyalty to the cloud. Tango Card’s Rewards-as-a-Service (RaaS®) API enables software providers to elegantly knit sophisticated rewards programs for their customers and employees into their business. Currently, over 2000 businesses rely on Tango Card’s Reward Delivery Platform. Tango Card powers reward delivery in successful programs driving behaviors to yield business results, such as loyalty, acquisition, research, wellness, and engagement, and to simplify payment disbursements for research participation, rebate, and warranty. When CIOs work with a rewards and incentives provider, they are naturally inclined toward leveraging a solution that is easy to deploy, works with accurately documented, scalable, and secure APIs. To ensure this, the elements of gamification have been infused into loyalty and influencer marketing, wellness, all levels of education, and community building for loyalty and research over the years. This encompasses many trends—from cutting-edge UX design geared for personalization to high-performance cloud computing, used on top of and within SaaS apps, web and mobile fluidity, multiple screens, and the need for high levels of security—especially for education and healthcare applications. “Tango Card is equipped to support all of these use cases by delivering unique propositions: a fast, secure, and global reward delivery platform and delivery technology,” says Nat Salvione, Chief Commercial Officer at Tango Card. Further, the firm recognizes gamification’s heavy maintenance price tag and new security threats, including the need to collect PII, and has built an enterprise-grade API with solid and accurate documentation. Tango’s API is already at scale, and the company has invested heavily in security all to ensure a great experience for its customers and CIOs. Tango Card’s Reward Delivery Platform lies beneath all of its other software and serves as the engine, heart, and soul of the firm. The platform delivers powerful rewards and incentive programs for businesses through its three components: international reward catalog—comprising e-gift cards, open loop Visa and MasterCard reward cards, non-profit contributions and more—the reward delivery technology, and customer and reward recipient service. 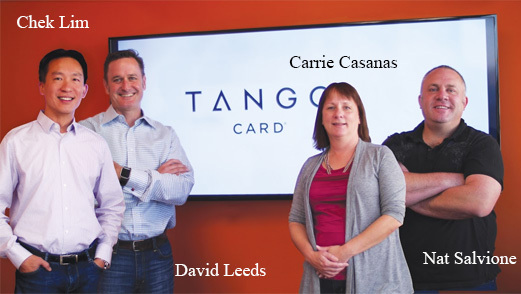 Through its ‘desirable e-gift card catalog,’ Tango Card puts e-gift cards, prepaid VISA or MasterCards, digital checks, and donations into one catalog. Organizations do not need to source their own rewards or incentives and can still have access to rewards of all values—the perfect complement to game mechanics. The firm’s Reward Delivery Platform and the Rewards as a Service (RaaS®) API allow customers to build or incorporate their reward, incentive, and disbursement programs the way they need. In addition, Tango Card assists clients in choosing and integrating the right incentives to boost its gamification scheme. “Organizations may or may not have experience in designing the incentive portion of their scheme. We can also create a custom Reward Link to curate the choice incentive for any particular program. And since happy recipients continue engagement, we provide support to each one of them,” adds Leeds. Enterprise consumers expect applications to have related products and services integrated either in their core product or application exchange. Tango Card’s API fully supports B2B applications that need a one-to-many structure. The firm’s RaaS® API has evolved to incorporate everything developers need to build a reward program right into their UX. In addition, Tango Card also provides proprietary software such as Blast Rewards, Rewards Genius Portal, and Reward Link, which steers the firm ahead of the competition curve. “The other core thing that separates Tango Card from other providers is our focus on our customer’s programs and the results they are expecting to receive from adding rewards,” mentions Salvione. “While all of our competitors focus primarily on consumer gift card sales or prepaid VISA or MasterCard breakage revenue models, we have built Tango Card from the ground up to deliver simple and effective B2B incentives.” The firm has developed a catalog of gift cards, cash cards, non-profit donations, digital goods, and international content which allows employees to receive desirable rewards. “On top of that, rewards need to be easy to send and awesome to receive—Tango Card’s mission statement—which is where our technology and service shine,” says Leeds. The end result is an increased engagement across the board, which is also a key outcome of gamification. "Rewards need to be easy to send and awesome to receive—Tango Card’s mission statement—which is where our technology and service shine"
Tango Card has grown rapidly since it came into being with its ability to provide variable amounts of rewards in real time facilitating the motivation that the modern loyalty programs are looking for. Tango Card has been exclusively built to deliver digital products with its key innovation targeted at making hundreds of gift cards available for choice and providing them instantly for immediate use. “Every single gift card we deliver, every moment of inspiration, every satisfied recipient is helping a business achieve success—that is our focus, and that is our purpose,” adds Salvione. Leeds believes that delivering e-gift cards may seem simple, but behind the delivery platform lies all of the complexity of retail relationships, thousands of items of inventory, international currencies, payment flows, security, availability, real-time APIs, email delivery, and service modules. “Our RDP – reward delivery platform – has been purpose built for enterprise customers resulting in a delightfully simple interface for both our business customers and their recipients. Our undivided focus on modernizing enterprise rewards focusing on our mission will stay unhindered in the future,” concludes Leeds.